His Magic Show is witty and fun and has lots of humour. His show is family orientated and full of magic – creating a real magical experience to all those who watch. His show is full of clowning, magic and audience participation – both audiences in the UK and internationally enjoy his show. He has performed his show around the world – Canada, USA, Denmark, Spain, Italy Germany, France, Holland, Singapore, and Malaysia just to name a few. 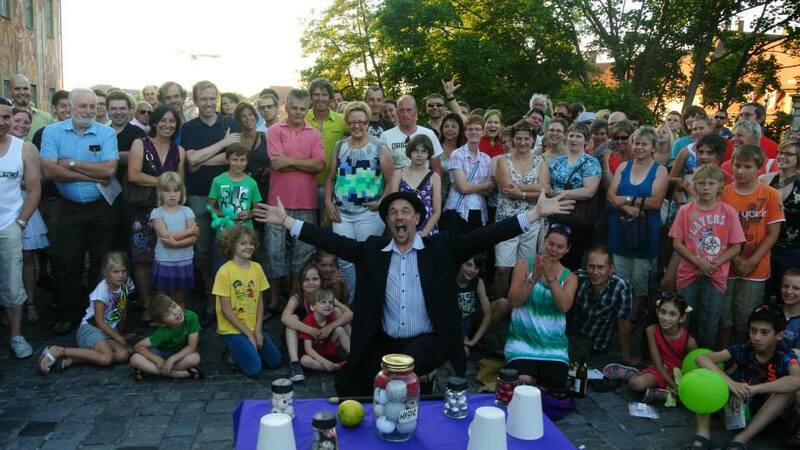 His Magic show is wonderful to watch and the whole audience feel a part of the experience. Mario also performs a duo act with his wife Veronica and together they provide a high impact family comedy street show called the Mad Hatters that was Commissioned by the Arts Council of Wales. We wanted to say a huge ‘thank you’ to you for entertaining everyone so brilliantly at our outdoor festival! Your entertainment ensured everyone was happy and in a good mood for the day. You certainly got the crowds going and your show was a huge hit. Thank you! Mario brings his skills as a street performer to large scale events by bridging the acts and performing comedy and magic throughout the day. Book him for your large scale event. Mario Morris and his team organise events and performers for large scale functions.